Heat gas or charcoal grill. In small bowl, mix glaze ingredients; set aside. Sprinkle chicken with salt and pepper. Place chicken on grill, skin side down, over medium heat. Cook 10 minutes. Turn chicken; brush half the glaze evenly over chicken. 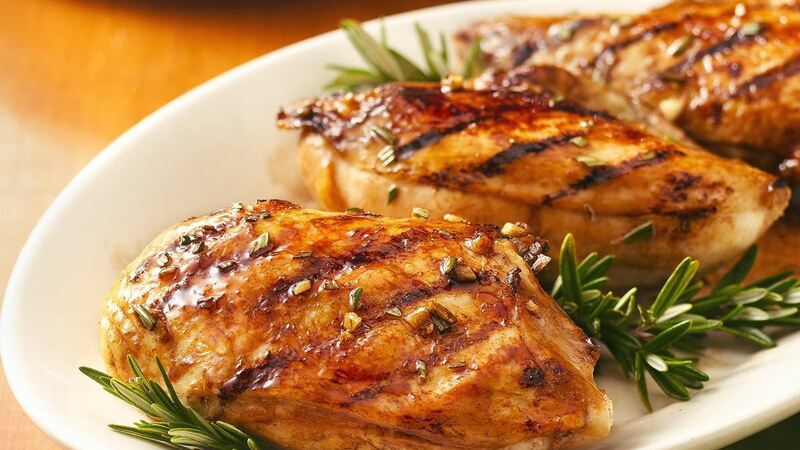 Continue cooking and brushing with remaining glaze 10 to 12 minutes longer or until juice of chicken is clear when thickest part is cut to bone (170ºF). Substitution : Substitute any fresh herb such as thyme, oregano, tarragon or Italian parsley for the rosemary in this recipe. Tip: This all-purpose glaze tastes fantastic on any cut of meat. Try it on pork chops or steaks.